Queen Murdock Goff’s new book “T.J. 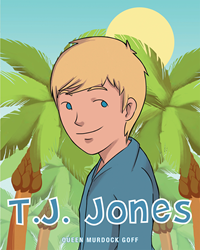 Jones” is a creatively crafted and vividly illustrated children’s book that portrays some of life’s lessons. Recent release “T.J. Jones” from Page Publishing Author Queen Murdock Goff is both entertaining and educational; this vibrantly illustrated work tells a story about a growing boy, school and right versus wrong. Queen Murdock Goff, a devoted writer and author, has completed her new book “T.J. Jones”: an innovative and creative work that is the perfect read for both children and adults alike! Published by New York City-based Page Publishing, Queen Murdock Goff’s enlightening work explores the ideas of personal identity and responsibilities. T.J. Jones comes to the rescue in an unlikely set of circumstances. Ben is exposed for his bad actions and learns some valuable lessons about life in the process. Readers who wish to experience this enjoyable work can purchase “T.J. Jones” at bookstores everywhere, or online at the Apple iTunes store, Amazon, Google Play or Barnes and Noble.